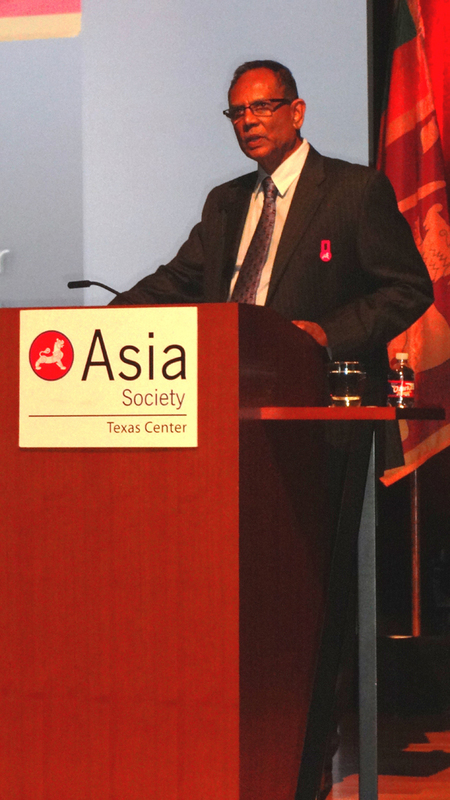 HOUSTON: On Wednesday, October 9, the Asia Society held a gathering, at which Vasudeva Nanayakkara, a Senior Cabinet Minister from Sri Lanka, addressed the efforts at reconciliation in Sri Lanka. The Minister was introduced by Charles Foster, Chairman of the Asia Society and by the Honorary Counsel General of Sri Lanka, Bandula Wijay with special thanks extended to attorneys George Willy and Rajneesh Chaudhary for making the event possible. 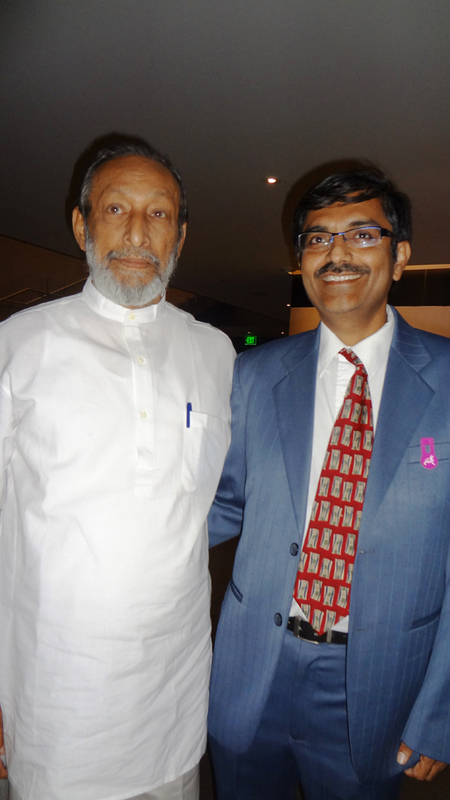 In his address, Nanayakkara pointed out the various points and factors leading to the conflicts that have ravaged the beautiful island country and prevented it from being what it has the potential of becoming. Some of the main points of conflict are the cultural, racial, social, religious and economical differences between the Tamils of the north and the Sinhalese of the south; Muslim Tamils of the East and Tamils in the Hill Country. “Historically, there was no Tamil and Sinhalese conflict. They even intermarried”, explained the Minister. Perhaps, as Nanayakkara pointed out, at the core of the conflict lies the question of, “who owns Sri Lanka – and in what proportions and what parts?” The Sinhalese claim to be the original inhabitants of the island nation, whereas the Tamils, who migrated to Sri Lanka centuries ago, consider it to be equally entitled to claiming rights to it as the Sinhalese. Once the Dutch and British colonizers left in 1948, Sri Lanka was left to face the divisive conflict on its own. 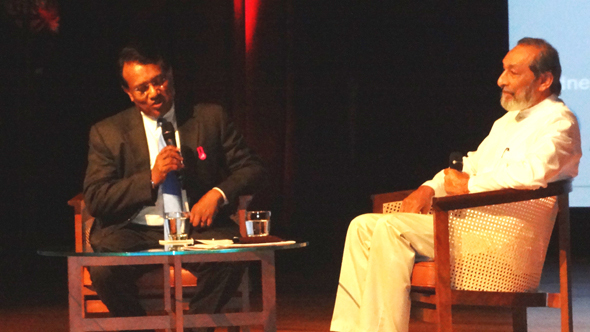 Conflict gives rise to humiliation, according to Nanayakkara, and wars are not fought by rules meted out by the UN. Sri Lanka has paid a hefty price for the conflict and civil war it has undergone. The “conflict” of Sri Lanka was brought to an end by the LTTE rebels (considered as terrorists) being vanquished, which lead to celebrations by the Sinhalese. Now the island nation is dealing with smoldering embers of that conflict, so those trying to bring about reconciliation are walking on a very precarious path. Nanayakkara explained that during the civil war of Sri Lanka, a large number of Tamils of the north, fled to the relative safety of the south or the hills. The deflection of Tamils to India and southern Sri Lanka has weakened the Tamil stronghold of the north, thereby giving them weaker bargaining power. In an election, the Tamil voting power has been reduced considerably. Those who fled to the south are reluctant to return to their homes in the north. Some of the current issues the nation is facing are the struggle for equality and balance of power at the level of local communities. Many feel an excessive military and police presence, which needs to be reduced. Local senior police officers and bureaucrats deal directly with the Governor (appointed by the President) instead of local government authorities. Governors usually have strong ties to the armed forces and the central government is not desirous of dealing with local authorities. Furthermore, during the war, the infrastructure of the north was destroyed. Railway lines are now being reconstructed with assistance from India, roads have to be rebuilt and electrical power to be available to the communities of the north. Nanayakkara emphasized the importance of promoting new social consciousness; one of understanding and mutual interest; of integration, not assimilation. At the end of the Minister’s speech, George Willy led a Q & A session with questions ranging from having a national language to learning from the efforts of South Africa in reconciliation. Many of the Sri Lankan attendees said that there were more issues to the conflict that those addressed, and that it would take time and effort to resolve them. However, they all agreed that the Minister was on the right path, and were glad that steps were being taken to bring about much needed change.